A man impregnated his own daughter, tried an abortion which failed. Now, he pleads with the court for a second DNA test, after the first one confirmed he is the father of the baby. The victim, Ama, was 16 years-old anda JHS two student at the Fynn Upgrade Preparatory School in Prestea, a vibrant mining town in the western region. Ama lived with her uncle until he passed away. Upon his death, Ama received orders from her biological mother to go live with her (Ama) father who had remarried in Prestea. Ama’s mother explained that her daughter’s father had not been responsible towards their ward’s upbringing and was therefore glad when he asked for their daughter to be sent to him to cater for her. On the 1st of January, 2013 when Ama returned hometo her mother at Eluku, a suburb of Nkroful in the Ellembelle District of the western region. She was pregnant and alleged her father was responsible. According to him, tradition demands in such situations that the man and daughter slaughter a goat on the community stool and parade themselves naked through the village. This will eventually result in the death of the man who committed the offence; an instant justice from the gods of the land. Narrating the story, John Dekyie mentioned that when the family invited the man whom his daughter alleged had put her in the family way for questioning, he came in the company of four elders from Prestea. He refused talking in the presence of the elders, neither did he deny the abominable act. After intense deliberations, he called Ama’s mother to plead that the matter be settled amicably. 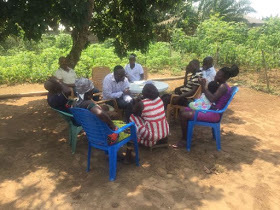 In exchange for her agreement, he promised to build a house for Ama’s mother.Later, he was reported to have sent four hundred and fifty Ghana cedis (GHC 450) to his ex-wife and daughter, for the pregnancy to be terminated. This bizarre story took another turn when the man asked his daughter to carry the pregnancy to term to ascertain if he was responsible. He asked for a DNA test to be conducted on the baby when born. Two years ago, the first DNA test was conducted at the Korle-Bu Teaching Hospital in Accra. It confirmed the man as the true father of the baby, but he still denied and disapproved the test results in court. He pleaded with the court to allow them a second chance at a SSNIT Hospital, which the court approved. Currently, the second DNA test result is readybut will be read to the court on February, 23 2017, in Tarkwa. Ama’s baby girl will be four years old on April, 11, 2017, but the family continues to wallow in poverty. Ama’s baby stayed stayed in an incubator for two months when she was born and till date, does not not look healthy. Ama’s mother also lamented, her ex-husband and father of her daughter and grand-daughter abandoned them when he demanded for the DNA. 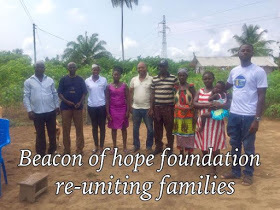 Today, a Non-Governmental Organization (NGO), Beacon of Hope Foundation has once again extended support to Ama, her baby and the family at large. Speaking to Atinka FM’s Patrick Ennimil Arthur, the assistant coordinator of Beacon of Hope Foundation, Richardson Dzameshie explained, the Foundation exists because of such victims of circumstances. He said they would do everything possible to assist Ama, her child and family to live decently. The family, overwhelmed by the Foundation’s commitment to their plight , promised to put to good use the support given them. Meanwhile, on February, 23, 2017, the Tarkwa high court will unseal the second DNA test and listen to its explanation from the Doctor who performed the test. Only then, will a verdict be given.